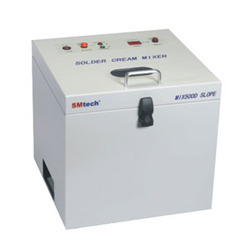 We are one of the leading manufacturers and suppliers of a wide assortment of Solder Paste Mixer Machine, which is designed and manufactured in accordance with industry defined standards. We are the leading manufacturer, supplier and trader of Solder Paste Mixer Machine. Simple structured, these machines are manufactured using high grade raw material and components. It helps to achieve better results of stencil printing and re-flowing processes. These flawlessly designed paste mixing machines are appreciated for their optimum functionality and long service years. Looking for Solder Paste Mixer Machine ?